An offensive end in college, Brown went undrafted and was initially signed by the Houston Oilers in 1963, who converted him to cornerback. He was cut in the preseason and the Broncos signed him. Brown was a reserve in the defensive backfield before getting an opportunity to start later in the year. While his performance was initially shaky due to inexperience, he intercepted one pass and showed improvement as the season progressed. Broncos went 2-11-1 to finish fourth in the AFL Western Division while leading the league in most points surrendered (438). 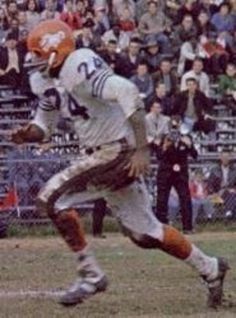 Following his breakout season, Brown’s interceptions dropped to two in 1965 while dealing with injuries but he repeated as an AFL All-Star. After four years in Denver, he was traded to Oakland in 1967 and was a key defensive component as the Raiders won the AFL Championship and continued to contend well beyond that. Brown intercepted seven passes, one of which he returned for a TD, in ’67, which was the first of seven straight years in which he was chosen to either the AFL All-Star Game or, following the 1970 merger, the Pro Bowl. He was also a consensus first-team All-AFL choice in 1968 and ’69. Fast and with excellent instincts, Brown was also highly adept at bump-and-run coverage. He had an off-year in 1970 due to a shoulder separation but still made the Pro Bowl and bounced back to be a consensus first-team All-NFL selection in ’71. Brown lasted a total of 16 seasons and intercepted 54 passes, with 15 of those coming with Denver. His 9 in ’64 remained his career-high. In 17 postseason games he picked off another seven passes, three of which he returned for TDs, including one for 75 yards against the Vikings in Super Bowl XI following the 1976 season. Brown was a consensus first-team All-AFL or All-NFL choice five times, received some first- or second-team recognition after another six seasons, and was selected to nine Pro Bowls. He was inducted into the Pro Football Hall of Fame, Class of 1984.